MAG, the owner of Stansted, are submitting their proposals for a 2nd runway to the Airports Commission. They also believe it has the potential to become a UK future 4 runway hub airport. MAG argues that the airport offers the cheapest and least environmentally damaging location (quite how it could do that, on a countryside location is unclear) for a 4-runway airport and estimate that it would cost £10 billion, although no detailed plans have been drawn up. Local campaign group, Stop Stansted Expansion, said that the MAG proposals were reheating plans put forward back in 2002 that were withdrawn by BAA, the former owners, in 2010. SSE’s chairman said: “We really shouldn’t have to go through this whole argument again just three years after the last threat was lifted. We are profoundly disappointed that MAG has behaved in this opportunistic and irresponsible way. With the airport currently operating at only half its permitted capacity a 2nd runway – never mind a 4-runway hub double the size of Heathrow today – is completely unnecessary on business grounds and it would be completely unacceptable on environmental grounds.” MAG has to admit that it could serve almost double the current number of passengers, without any more infrastructure for some years. The owner of Stansted is delivering a submission to the Airports Commission including two options for a second runway and pointing to its potential transformation into Britain’s biggest four-runway hub. Manchester Airports Group (MAG) will argue that the airport offers the cheapest and least environmentally damaging location if the government-appointed commission decides that a single super-hub is the answer to the country’s aviation needs. It estimates the cost of transformation into a four-runway hub at £10bn, although no detailed plans have been drawn up. However, MAG stresses that it believes far more passengers could be served without immediately expanding its infrastructure and will present Stansted as the most flexible option to meet growing demand for flights. Local campaigners said the proposals were “opportunistic, irresponsible and pointless”. Charlie Cornish, chief executive of MAG, said: “Our short-term priority is to make Stansted better for passengers than ever before, and we’ve made major progress in our first four months of ownership, including starting work on an £80m terminal transformation. “Stansted is uniquely placed to meet the UK’s aviation capacity needs now and over the next 15 years. Almost overnight, Stansted could double the number of flights it handles without any need for significant investment in new infrastructure. MAG is anxious to promote the claims of its other airports, primarily Manchester, as well as East Midlands and Bournemouth. All have spare capacity and the regional airports point to millions of passengers who travel to London rather than flying from their nearest base. Cornish said MAG believed an approach that maintained competition between airports was the best solution. He said: “Developing new capacity at a number of airports is likely to be best for passengers. Should the commission take a different view and conclude that the UK needs an effective hub to provide international connectivity, then Stansted could certainly fulfil that role in a cost-effective way. MAG will say an additional runway could be built either to the north-west or the east of the existing runway, raising its capacity to between 70 and 90 million passengers a year. An expanded Stansted’s noise impact would be a small fraction of Heathrow’s. Only 1,250 residents currently suffer noise above the 57 decibel average nuisance threshold, compared with 258,500 at Heathrow. Local campaigners Stop Stansted Expansion said that the MAG proposals were reheating plans put forward back in 2002 that were withdrawn by BAA, the former owners, in 2010. The campaign group’s chairman, Peter Sanders, said: “We really shouldn’t have to go through this whole argument again just three years after the last threat was lifted. We are profoundly disappointed that MAG has behaved in this opportunistic and irresponsible way. MAG bought Stansted from Heathrow early this year for £1.5bn after its former owners were forced to sell by the Competition Commission. The group has said it will invest £230m in transforming the current facilities after years of passenger decline. The Airports Commission, led by the former Financial Services Authority chief, Sir Howard Davies, set this Friday as a deadline for submitting long-term proposals for new runways. Heathrow and Gatwick are both arguing for extra runways, while London mayor Boris Johnson has argued for new airports in the Thames estuary or Stansted expansion. A shortlist of options will be announced by the end of 2013, with final recommendations published after the 2015 general election. New owners M.A.G have today set out London Stansted’s potential to meet air capacity demand in London and the South East in the short, medium and long-term, and presented a range of options which it believes should be on the Airports Commission’s shortlist for further study in 2014 and 2015. M.A.G’s submission, ‘Capacity for Growth’, responds to a call for evidence from the Airports Commission which is examining options for meeting the need for additional airport capacity in the South East. “Our short-term priority is to make Stansted better for passengers than ever before, and we’ve made major progress in our first four months of ownership, including starting work on an £80 million terminal transformation. “Looking to the long-term, the interests of passengers will be best served by a pragmatic approach, focused on delivering new capacity that is cost-effective and flexible, and capable of driving competition across the aviation industry. Options for an additional runway, either to the north-west of the existing runway (with capacity of between 70 – 80 million passengers a year) or to the east of the existing runway (with capacity up to around 90 million passengers a year). An airport with four runways (with capacity of between 140 to 160 million passengers a year) designed and operated as an effective hub airport with good resilience and easy connections for passengers between flights. The Airports Commission has identified the criteria it will use to evaluate the options for expansion. Stansted is well placed against each of these criteria as a viable, cost competitive expansion option, with lower environmental and social costs than the alternatives. Of particular note is the fact that even with new runway capacity, Stansted’s noise impacts will be a small fraction of those experienced around Heathrow. Capacity development at Stansted would support London’s development to the east and along the London-Stansted-Cambridge corridor, and act as a catalyst for growth and productivity in a region that will be critical to driving economic growth in the UK in the future. Stansted is a scaleable and flexible solution to the UK’s aviation capacity needs – able to offer additional capacity and then grow incrementally to two, three or four runways in the future. Fewer residents are exposed to noise at Stansted than at other major airports in the South East; 258,500 at Heathrow compared to 1,250 at Stansted. The space for additional runways, terminals, roads and rail connections is more readily available at Stansted than at alternatives. Stansted is likely to represent the most cost-effective solution for the country. It is estimated a on-airport cost of developing a four-runway hub at Stansted would around £10bn – much less than the cost of an Estuary Airport or expansion at Heathrow. Stansted could be developed into a four-runway airport capable of handling up to 160 million passengers a year for £10 billlion, its owners have said. Manchester Airports Group (MAG), which bought Stansted for £1.5bn in February, has set out several options for expanding the Essex airport, including transforming it into a four-runway hub which could serve between 140m and 160m passengers a year. The group has also presented the Government-appointed Davies Commission with options on where it could build a second runway at Stansted, to the north-west of the existing runway or to the east. Stansted has found itself at the heart of the debate over where to build new runways in the South East of England, with the Mayor of London suggesting it is one of the locations where a new four-runway airport could be built to replace Heathrow. Gatwick has suggested Stansted could form part of a “constellation” of two-runway airports to serve London. Stansted, which sought planning permission for a second runway in 2008, only for the proposal to be scrapped, argues fewer local residents in its vicinity are exposed to noise than at any other of the major airports in London. 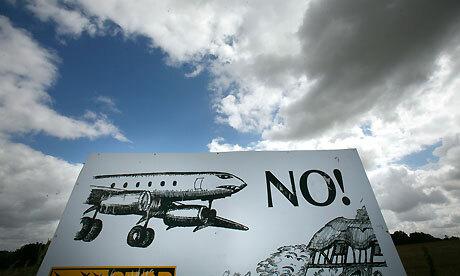 A second runway to the north-west of its existing runway would allow the airport to handle 70-80m passengers a year. A second runway to the east would boost the airport’s capacity to 90m passengers a year, according to documents released this morning. The airport, which has been in decline since 2007, currently handles 17.5m passengers a year although it could accommodate as many as 40m-45m without building any additional runways. MAG estimates it would cost around £10bn to transform Stansted into a four-runway “super hub”, although this doesn’t include the cost of improvements to rail and road links. This compares to the estimated £14bn-£18bn cost of adding a third runway at Heathrow or the £50bn price tag for a new airport in the Thames Estuary. Stansted has published its proposals as the deadline closes today for submissions to the Airports Commission, which is chaired by former Financial Services Authority boss Sir Howard Davies. Earlier this week, Boris Johnson backed a new airport on the Isle of Grain in north Kent as his preferred option for solving Britain’s aviation logjam, although he also put forward proposals for transforming Stansted. Heathrow hit back on Wednesday with plans for a third runway at three potential sites, one at the village of Stanwell Moor in Surrey , the second at Harmondsworth in Middlesex and the third at Sipson north of the airport. Gatwick will publicly publish its full report on Tuesday.